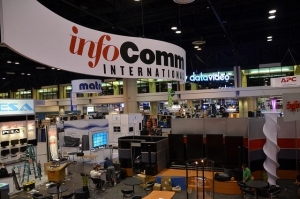 June is the month that Arizona Audio Visual makes its annual pilgrimage to the InfoComm Trade Show. This year the event was held in Las Vegas and as usual the conference offered a myriad of display booths from countless manufacturers from all over the world. Every year there are a number of new technologies that capture the attention of attendees. This year was no different and one in particular caught our eye as being worthy of sharing with our clients. Kramer Electronics, one of our business partners was showing off their new VIA wireless connectivity and collaboration devices. In a nutshell, this technology allows a wireless connection to either a TV monitor or projector in a meeting room from virtually any device including both PC and Mac computers, any smartphone or any tablet. Once the user downloads the Kramer App he or she can connect and show their screen on either a TV monitor or projector in the space. Up to 6 users can do this at the same time. In addition meeting participants can also see what is being shared on the screen on their own device. Another great feature is that the system allows document collaboration. For example, an Excel document is being shown on the screen by one of the meeting participants. Any other meeting participant can interact with the document and make changes. Other useful features include file sharing, connectivity with third party meeting programs such as WebEx and Skype for Business, 1024-bit Encryption, 1080p video playback and iOs and Android Mirroring. These devices are ideal for conference rooms and huddle spaces. Call us today to find out more.